O.K. Y'all know that I like bugs... well, excluding ticks, mosquitoes, chiggers, and black fly gnats. I like the COOL bugs. I tend to see a beauty in them that most others don't see. I find them fascinating, intriguing, and, yes, sometimes beautiful. With the star of this week's Camera-Critters, well, I find these critters comical, full of personality, and fascinating all at the same time. Maybe after viewing all my bug posts, I might inspire just one person to, instead of running away from a bug, stop and actually look at it and watch it. They're really not something to fear... well, most of them anyway. Pretty cool, huh? O.K. fine... YES, I CAN see you rolling your eyes and shaking your head at me. After, you're done researching olivella, click on the badge below and join in on Camera-Critters. The linky sign-in will be open around 10 am Saturday morning. 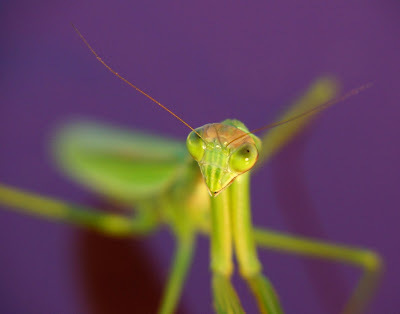 Great Praying Mantis photos, they are a fascinating creature, to bad we don't have them here in Middle Alberta. 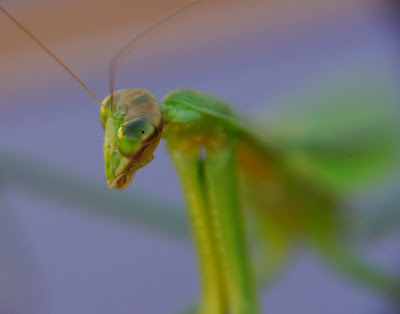 Great shots of the praying mantis. I love the close ups. One gets a far greater appreciation of these amazing tiny creatures. Love that face...it has so much expression!!! I think she is very cool....and beautiful too. I love the purple background. It really makes the guy stand out. love THE LAST ONE PHOTO!!!! What brilliant shots! And such a lovely face on that critter. Awesome closeups and a cool looking bug. She deserves to be the star of the show! Nice! My critter post, have a nice weekend! I adore bugs (as long as they don't land on me unexpectedly or draw my blood). Don't see many praying mantises around here so this is a real treat for my eyes. These are great macro photos. Mantids are great subjects to photograph. You can feel a thought process behind those eyes. Excellent close-ups. 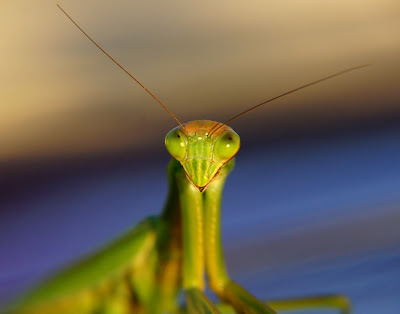 Mantis are awesome! Thanks for sharing! Here is my entry. I love bugs too and the mantis is one of my favorites. I was mowing the lawn a couple of days ago and rescued three of them, moving them off the lawn onto some bushes. Great macro shots of this little cutie. Very cool. You can see the attitude on the face! I love your bug shots, keep 'em coming. I love the purple back ground too, what is it?